On this auspicious occasion of Diwali, all of us here at THN would like to wish you a very Happy Diwali and a wonderful year ahead ! We hope the lights of the season andthe festivities bring you and your family tons of joy and good luck. A festival full of sweet childhood memories,sky full of fireworks, mouth full of sweets, house full of diyas and heart full of joy. 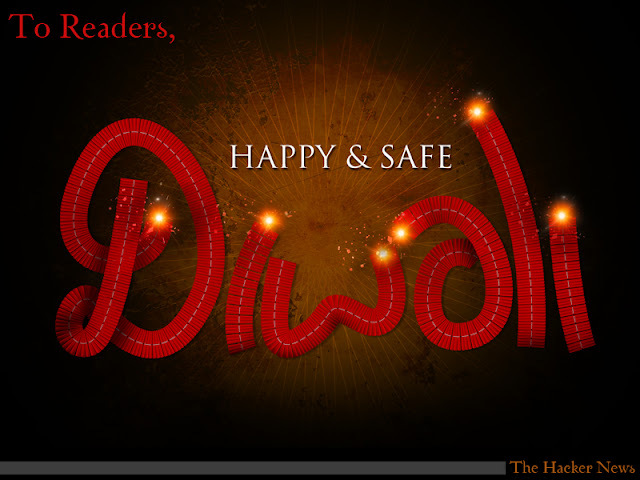 The word Diwali means "Rows of lighted lamps" , Known as the Festival of Lights, Diwali holds significance to the Hindu, Sikh and Jain religions and is a public holiday in India.We should pledge that we will make an all-out endeavour to make Diwali 2011 a pollution-free festival. The Hacker News has evolved to work closely with and within the cyber security communities in an effort to make the internet more secure. THN is dedicated to making your learning a valuable experience by enhancing the depth of your knowledge through real-time, hands-on work experience. We are planning to get some shots of the occasion which I shall on same site (THN), so do keep in touch. Enjoy your holidays and just because we can't say it enough, have a very Happy and a safe Diwali.